If your dog or cat has suffered an accident or injury and is bleeding, the first step you need to follow is to calmly assess the situation, determining the severity of blood flow. If it is a minor scrape or cut, you can handle it yourself. However, if your pet is bleeding anywhere from moderately to severely, you need to act quickly and get to the vet. Examine the area carefully and thoroughly, and keep in mind that if your pet is in pain, they might try to bite you. Vets recommend muzzling even the sweetest of companions, because during an injury, fear can take over. If you pet is unconscious or showing signs of shock (pale or white gums, a rapid heartbeat, or rapid breathing), check for a heartbeat and normal respiratory rate, and get on the phone immediately to a vet clinic to talk you through CPR. Find the source of the bleeding. Do not try to remove any deeply lodged objects because you can do more harm than good. Let your vet remove any foreign objects in your pet. 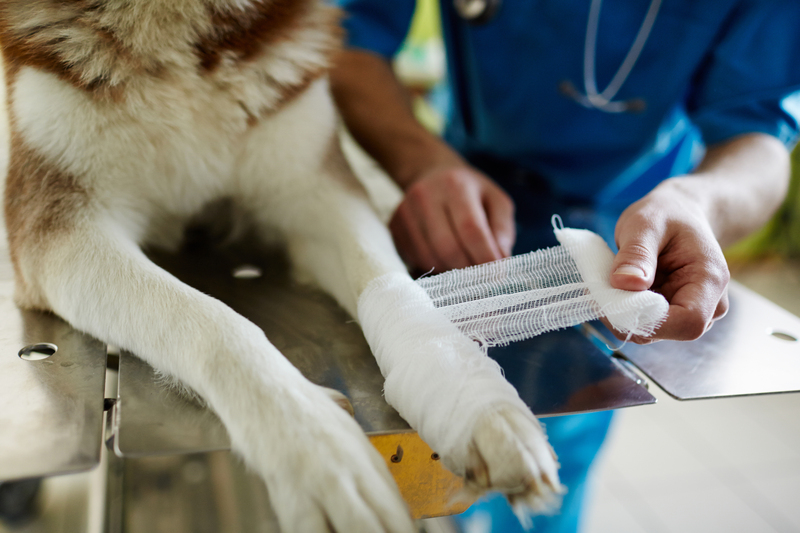 Apply direct pressure using gauze to the wound, and if the gauze soaks completely through, do not remove it – simply add more gauze on top of it until you get to the vet ER. If you do not have gauze on hand, use any fabric that can absorb blood (t-shirts or towels work). Call the nearest vet hospital so they can prepare for your arrival. Write down everything they say and follow it as closely as you can. Try to remain calm. Clean the scrape or cut with a mild antibacterial soap (think Dial). You can also use a solution of 50/50 water and hydrogen peroxide to disinfect the cut. You still need to apply pressure with gauze or some pet parents use an ice pack wrapped in a towel. Note: If you can’t stop the bleeding after 10-15 minutes, treat the situation as an emergency and get to the vet. If you’ve controlled the bleeding of a minor injury, you can then bandage the area if it’s a paw or leg (if the wound is on your pet’s belly or head, you’ll most likely need to go to the vet). Apply triple antibiotic ointment and wrap with gauze. You can then go over the wrap again with an elastic bandage to secure it. Make sure you can slide 2 fingers beneath the bandage so it’s not too tight. The best way to keep your pet from licking or chewing on the bandages is to use an Elizabethan collar (aka the “cone of shame”) or a donut. You’ll also need a contingency plan for any pups going outside to use the bathroom – keeping their bandages dry can be a challenge! Try taping a plastic bag over your dog’s bandage or for paw scrapes, use a commercial dog bootie. For even minor cuts and scrapes, if you notice discharge, pain, or further bleeding, get to the vet. Healing may take some time and you’ll need to keep your pet calm and inactive. Knowing how to treat a bleeding pet is an excellent step in responsible pet parenthood. We also recommend learning how to use a splint or tourniquet, and stocking up a first aid kit. It should include essentials like food, water, towels, bandages and gauze, ointments and scissors, and don’t forget first aid guides! The internet may not be accessible to you if you’re hiking with poor service, or perhaps you can’t find your phone. Keep a copy of the American Red Cross’ “Pet First Aid” and Pet Emergency Pocket Guide (full shopping list for a good first aid kit is available on Be Prepared: Emergency Pet Safety) and you’ll know what to do in the flick of a page. By having pet insurance, you can get reimbursed up to 90% on vet bills and say “yes” to life-saving procedures. If you haven’t enrolled already, start by getting a free quote. 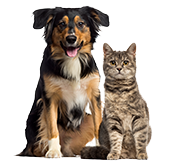 For more information on emergency care, check out our article, “Emergency Wound Care” for what to expect at the vet hospital or if your pet needs surgery.